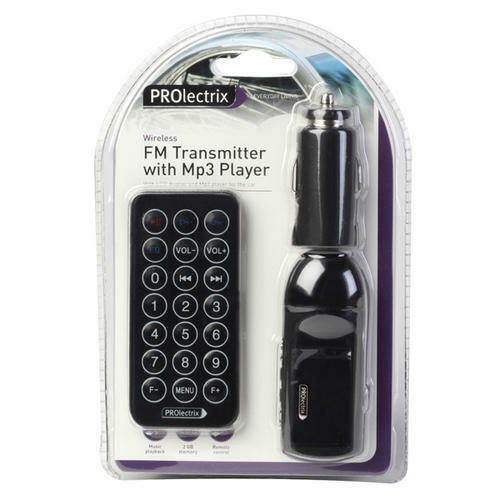 Listen to all your favourite songs on the move with the Prolectrix Car FM Transmitter. Simply connect to your mobile phone or MP3 player, tune your radio in to the selected empty FM frequency and enjoy the music. For added functionality, this transmitter also doubles up as a mobile phone charger - just hook it up to your USB charging device. Plug and play, simply set the station you want to use and connect your music. Doubles up as a mobile phone charger. 1.4" LCD display - shows frequency, track numbers and song names. Powered by you car's cigarette lighter.